"No one can guarantee a #1 ranking on Google. Beware of SEO's that claim to guarantee rankings, allege a "special relationship" with Google, or advertise a "priority submit" to Google. There is no priority submit for Google". 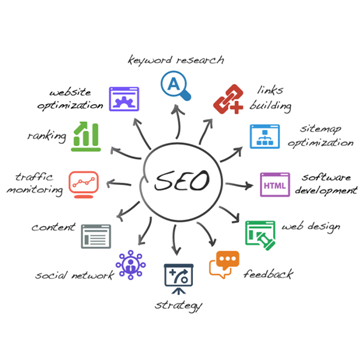 With our SEO package we CAN'T guarantee your rankings. However, we can give you an honest service, using our knowledge and skill to get your website as high up as possible when searched for in search engines. Google have different types of listings to show up on their search engine results page. The main type is 'organic listings', which is a natural listing based on a series of factors which determines their relevance to the searched term. These algorithms are generally based upon factors such as the content of a website, external back links and social media. They also have paid listings which is something you can look into once your website is growing. We will install software onto your site which you can log into and monitor the activity on your pages. You will be able to view hits on your site, current users, user location etc to track your views. We will compile this into a monthly report for you for analysis. Keeping your website up to date with the latest news and features is vital to the success of our SEO campaign. Here at Purple Jam Designs, we have many tools and hints at our fingertips to give you the best possible chance of hitting those top spots! Already have a website but it doesn't show in Google? Firstly, we would assess your current site and agree on changes that need to be made. We will also need to transfer your website to Purple Jam's own hosting (this is something we can do our end, so no work for you!) and provide our monthly services package. Please don't hesitate to contact us regarding this for a FREE quote or a consultation. We will work alongside you to provide you with as much information as possible to get your site as much traffic as possible. Results with SEO are never instant but in time a positive difference will be seen.